The Bull Inn – 01905 451509 – Great food, every day. Ideally situated between Worcester and Droitwich with plenty of parking. Pop in for your lunch with your office colleagues, or fill your belly before the rugby at Sixways. Great food, every day. Ideally situated between Worcester and Droitwich with plenty of parking. Pop in for your lunch with your office colleagues, or fill your belly before the rugby at Sixways. Full English breakfast from £8 per person with tea & coffee call to book in. 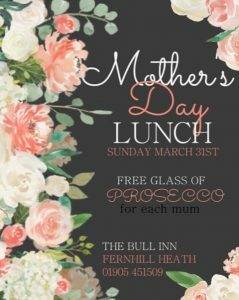 The Bull Inn occupies a prominent position on the A38 in the village of Fernhill Heath, which is halfway between Worcester and Droitwich with easy access to the M5. The Bull is a traditional Victorian building, but inside you will find a stylish, modern interior and a warm welcome. There are extensive lawns to the side and a large covered area for al fresco dining and drinking. Likewise, the food ranges from traditional to contemporary, using the best of ingredients. We have built up a proud reputation for our 21-day hung Herefordshire beef, our steaks are second to none! At the same time you will find a wide range of dishes, some with a Mediterranean or Asian twist. All our dishes are freshly home made, using locally-sourced ingredients where possible. Whatever your taste, we aim to provide a memorable value-for-money dining experience with a touch of class. Always a great atmosphere, the garden is a lovely place to chill with a nice Cider in the summer sunshine. Absolutely love the food here, the Cod is the size of a Whale! Make sure you bring your appetite (or a doggy bag). Sunday hours vary every week due to private functions. Please ask a member of staff for details.